A pupil of Bruno Giuranna, Luca Sanzò is a performer, recording artist, and teacher. A member of the contemporary music group PMCE and a founder of the Michelangelo Quartet, he is a regular guest of the Rome Chamber Music Festival and plays with musicians worldwide. He is viola soloist at Teatro dell’Opera di Roma, Cagliari’s Teatro Lirico, and Concerto Italiano. Viola professor at Rome’s Santa Cecilia Conservatory, he has published his revision of Campagnoli’s 41 Caprices for Viola Solo with Ricordi, participated in international festivals: Rome’s EMUFest, Institute International de Musique Électroacoustique de Bourges, Musicacoustica-Beijing, Monaco’s Électroacoustique, and Biennale Musica di Venezia, and performed in major concert halls: Stuttgart’s Forum Neues Musiktheater, Berlin’s Konzerthaus, Amsterdam’s Concertgebouw, and New York’s Metropolitan Museum. 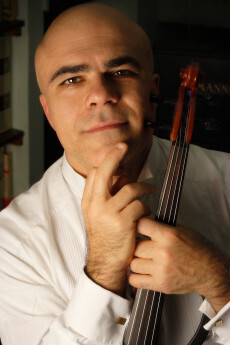 Mr. Sanzò has recorded for Nuova Era, Bottega Discantica, BMG, Ricordi, Opus 111, Tactus, Edi-Pan, Inedita, Stradivarius, Naïve, Chandos, and Naxos. Brilliant Classics issued his recordings of Paul Hindemith’s complete sonatas for viola and piano and for viola d’amore and piano. He plays a 1956 Igino Sderci viola and a 1977 Pietro Gaggini viola previously owned by Luciano Vicari.